Although our Sun is the only star in our solar system, that isn’t the case for every planetary system. It’s estimated that about than half of stars could be binaries, though the exact percentage is still hotly debated. What we do know is that binary stars are common. This has raised the question about how planets might form in binary systems. 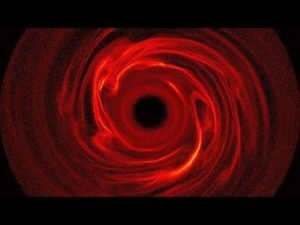 The usual view of planetary formation is that planets form within disks of material around a young star. While such protoplanetary disks are common around single stars, there has been debate about whether they are common around binary stars. While we have observed debris disks around young binary stars it hasn’t been clear whether such disks would be stable long enough for planets to form. After all, the gravitational interactions between two orbiting stars might make the surrounding region hostile to stable orbits. So far all the exoplanets we’ve found around binary stars have been large, Jupiter-like planets. They would have formed in the outer icy regions of the system. But what about rocky, Earth-like worlds? Could they have formed closer to the stars where orbits might not be so stable? A newly observed binary system suggests that they could. The system is called SDSS 1557. It consists of a white dwarf about the mass of our Sun, orbited by a large brown dwarf about 60 times more massive than Jupiter. Recently astronomers have observed a rocky asteroid belt surrounding the system. Diagram of SDSS 1557 showing the debris ring around the two central stars. Credit: J. Farihi, et al. This is important for two reasons. First, since the main star is a white dwarf, this is an old system. Our Sun will eventually become a white dwarf, but only after another 5 billion years when it reaches the end of its life. So it is possible that this asteroid belt has been stable for quite some time. Plenty of time for planets to form. Secondly, since the astroid belt is rocky and high in metals, it could form planets that are much more similar to Earth in size and composition. None of this means that the system actually has rocky planets. In our own asteroid belt no planets formed because of the gravitational pull of Jupiter. A similar type of gravitational dance might have occurred near SDSS 1557. But what this discovery does show is that we can’t rule out the possibility that Earth-like planets might exist with two Suns.